Colin Binns has been based at his studio on the Lancashire coast since 2001, where he works in mixed media painting and drawing. He constantly experiments with linework, texture, colour and collage, making art that explores a sense of myth, memory and place. 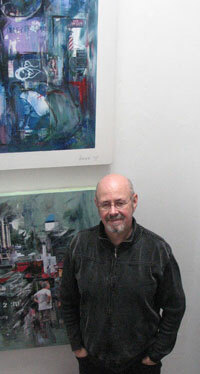 Following his MA in Fine Art in 2007 at the University of Central Lancashire he continued to develop mixed media ideas at the university’s Artlab print studios. This led to a residency where he combined screen print with painting and drawing, influencing his project on the changing nature of urban spaces. Prior to his art practice, Colin enjoyed a career as an award winning architect and partner in the international design company BDP, leaving the practice in 1993 to lecture in art and design at Manchester and Preston. He left full time lecturing in 2001 to focus on his art practice and has since exhibited extensively throughout the UK in commercial and public galleries. His most recent review comes from the arts correspondent of the Yorkshire Times. Colin Binns’ works are montages on paper using combinations of ink, watercolour, gouache, pastel and collage, which draw you into the scenes of York, and envelop you in the atmosphere which they create. Colin creates very memorable works, which shape your experience of walking through York’s rich architecture. Once you see his work, it will take over all your senses. It will come as no surprise to learn that Colin had a major retrospective exhibition at the Salford City Gallery and Museum in 2017.